It has struck me recently that we use the word "compassion" perhaps without understanding its original meaning. Compassion is a Middle English word that came to us via Old French from the Late Latin compatī, meaning "to suffer with" (com - "with" + patī - "to bear"). Compassiō meant "fellow feeling." A definition might be deep sympathy and concern for the suffering or misfortune of another. Synonyms include commiseration, mercy, pity, charity. There seems to be a sense of action in the word. Empathy is the ability to understand and share another's feelings, but compassion goes deeper and leads to some action to alleviate the other's suffering. 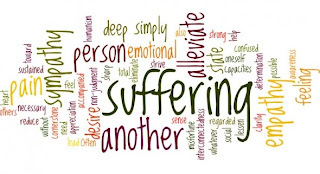 If we "suffer with" the other, then we will viscerally want to help end their suffering in order to end our own. That's why I cannot lose my focus on educating others about the climate change emergency. I do it to alleviate my own pain at witnessing those already impacted ... and the pain that comes from imagining all those who are going to be impacted. Call it an altruistic form of selfishness, if you will, but I just can't stop seeing African children in my mind's eye.